Click chart for more in-depth premarket data. Reports of a ballistic missile launch in the eastern Mediterranean region took the edge off a bullish stock market mood early Tuesday, with European indexes turning negative and U.S. futures trimming gains. Markets were still poised to rally strongly on 'Takeover Tuesday'. Nasdaq futures rose by as much as 1.2% based on a flurry of new deals. But Russian news agency reports that two "ballistic objects" had been launched towards the eastern Mediterranean revived concerns about a U.S.-led strike on Syria. Israel's Ministry of Defense confirmed that Israeli forces and the U.S. Missile Defense Agency had carried out a missile test and said Israel would release further information about the launch soon. Traders were in optimistic mood after Microsoft (MSFT) said it was buying Nokia's (NOK) mobile phones business for $7.2 billion and Verizon (VZ) agreed to a $130 billion deal that will see it take full control of Verizon Wireless. U.S. stock futures pulled back from earlier highs after the missile reports, though they were still up by roughly 0.7% to 0.9% from Friday's closing levels. Markets were also being supported by better-than-expected manufacturing data released in Europe and Asia over the long weekend. Microsoft and Nokia jointly announced late Monday that they had agreed to an all-cash deal worth 5.4 billion euros ($7.2 billion) that would see the software giant buy Nokia's mobile phone business and license many of its patents. The momentous deal pits Microsoft squarely against Apple (AAPL) and Google (GOOG) in the hotly contested smartphone arena. 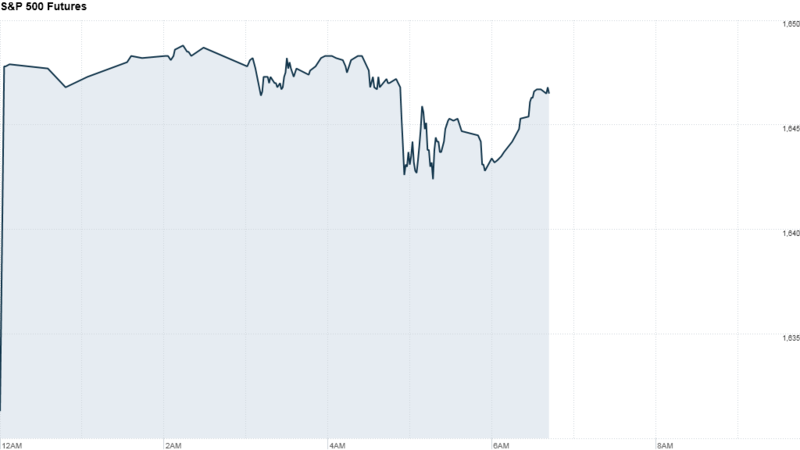 Shares in Nokia soared as much as 48% after the deal was announced. Investors are also still assessing the transformational Verizon-Vodafone deal that sees Verizon Communications take 100% control of the Verizon Wireless business unit from Vodafone (VOD). Both companies are hiking their dividends and say the agreement will allow them to focus on their core businesses. Plus, Time Warner Cable (TWC) and CBS (CBS) also reached an agreement to end a month-long blackout and restore CBS programming to about 3 million American viewers. European markets turned negative in morning trading after posting some impressive gains on Monday. The major regional indexes steadied after Israel confirmed the test firing but were still narrowly weaker. All major Asian markets closed with gains except for India's Mumbai Sensex, which dropped by 3.5%. Japan's Nikkei index surged by 3% while Hong Kong's Hang Seng and the Shanghai Composite pushed up by roughly 1% each.